Ronan Dunne is "extremely affable and has an excellent knowledge of competition and contract law". Google’s antitrust fine – just small change or a sea change? Ronan is a partner specialising in competition and commercial contract matters and leads the firm’s EU, Competition and State Aid group. Ronan advises a wide range of clients, in both the public and private sectors, on contentious and advisory questions of EU law, commercial vertical agreements (including distribution and supply agreements, particularly in the motor vehicle sector and the pharmaceutical industry), merger control, state aid and other competition law related matters. Ronan regularly provides ongoing advice to clients on their competition law compliance policies. This involves the provision of training as well as the update of written policies to ensure compliance with best practice. In addition, he has significant litigation experience in the context of complex competition law cases. Ronan also advises in respect of sectoral-specific regulatory matters, primarily those issues affecting the telecommunications industry, media and the pharmaceutical sector. Ronan joined Philip Lee in 2017. He previously worked as a senior associate for over eleven years in one of Ireland’s leading law firms. Ronan is a fluent French speaker. He regularly presents at conferences and publishes in journals on competition law related matters. He is also the Irish correspondent for the prestigious European Competition and Regulatory Law Review. 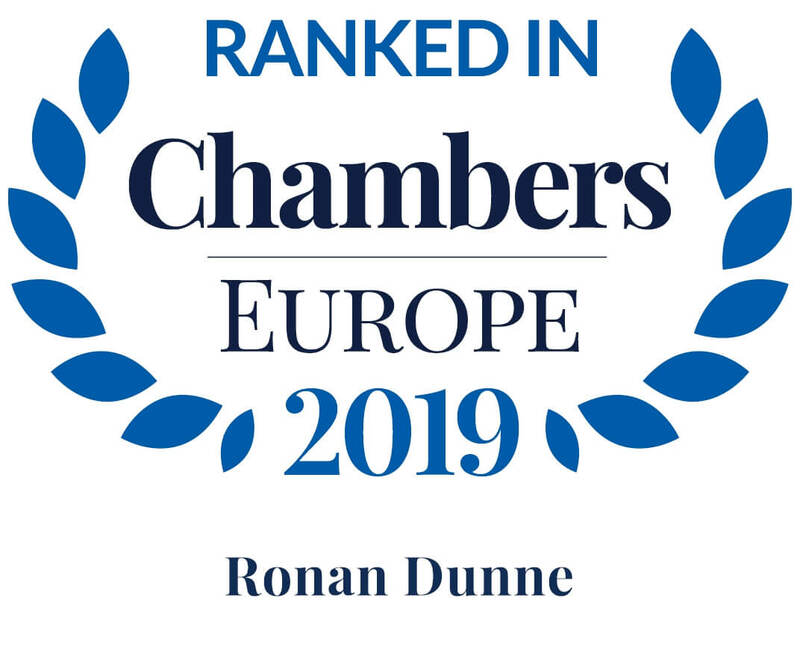 Ronan’s practice in the areas of merger control and state aid law was particularly singled out for mention in the latest edition of Chambers & Partners. He is also ranked as a “Next Generation” specialist lawyer in the field of EU and competition law in the latest edition of the Legal 500’s rankings.